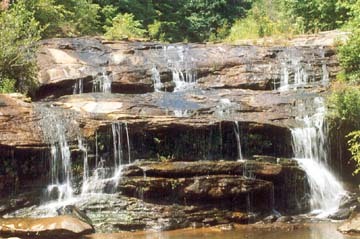 Todd Creek Falls is a local party spot for Pickens County residents. Don't let that stop you from visiting this pretty spot, though. The falls are 15 feet high and lay along a power line right-of-way on Clemson University land. The vegetation and weeds along the trail are head-high or taller during the summer months. Directions: From Six Mile, take SC 133 south for .5 mile to Maw Bridge Road. Turn left and drive 2.8 miles to Welcome Baptist Church. Take the next road to your right (Brookbend Road) and follow for .4 mile to the bottom of the hill. Look for the three sets of high voltage powerlines overhead to be sure you are at the right spot. Find a place to park along the side of the road. Look for a trail/road on your left and follow for several hundred yards. Tood Creek will cascade noisily along the way but don't fret. The trail/road crosses/skirts Todd Creek after .2 mile. Continue another .1 mile and take a steep path down to the falls. If you have a four-wheel drive, you could drive the path rather than walk it. From Keowee-Toxaway State Park on SC 11, take SC 133 about 13 miles to Six Mile.